It is hard to stress how dire the situation was for the Red Army in the summer of 1941. In as little as two months, 10,000 tanks had been lost to the German Army and her allies. Therefore, factories across the Soviet Union began to produce a myriad of improvised tanks and armored cars. The Izhorsky plant in Leningrad was one such producer, however, rather than up-armoring tanks like most other factories, Izhorsky up-armored and militarized trucks for combat, equipping some machines with a 45mm gun, and even going as far as creating a crude turreted armored car. The Izhorskiye Zavod (Izhora Plant) was established in 1722 in Saint Petersburg under the orders of Tsar Peter I, to manufacture items for the Russian Navy. The plant had a long career manufacturing naval goods including armor plates for their ironclad and pre-dreadnought ships. In 1906, the plant was awarded its own flag. Some time in the early 1900s, the plant moved onto vehicle manufacture. Before the war, the Izhorskiye (Iszhorky) plant was one of Leningrad’s largest producers of vehicles. Izhorsky manufactured such iconic vehicles as the FAI, BA-I, BA-3 and BA-6. Izhorsky also manufactured armor plates for tank production, these plates were mostly used in the T-37A, T-38 and T-40 tanks. Izhorsky had a long and proud history of manufacturing armored vehicles, and on the eve of WWII, the plant was producing armor plates for the T-40 amphibious tank, as well as military and commercial trucks. After Germany invaded the Soviet Union on the 22nd of June 1941, scores of Soviet tanks were lost. The Soviet Union was in desperate need for any armored vehicles that could stem the tide of the German invasion. On the 20th of July 1941, resolution 219ss was passed. This was a resolution for factories across the Soviet Union to begin manufacture of ‘bronetraktors’ (i.e. 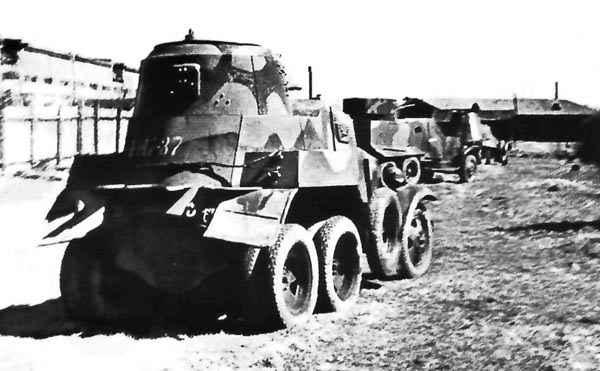 improvised tanks), and to up-armor tanks such as the T-26. This resolution did not specify that trucks should also be up-armored, however, Izhorsky proceeded with the implementation of armor on trucks. A GAZ AA Truck. 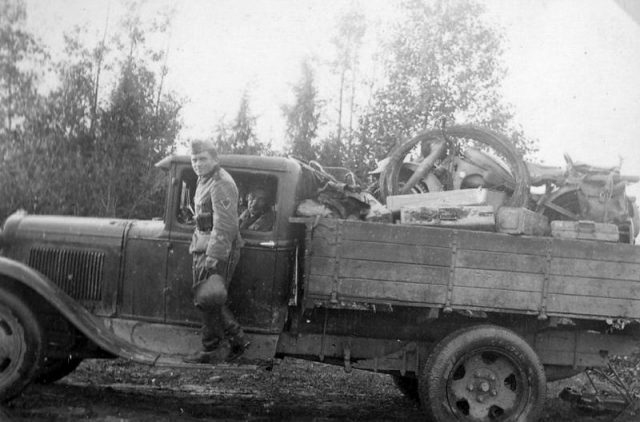 The key way to identify this truck over the ZIS-5, is the rear suspension. Notice the leaf suspension that looks as though it should have a second road wheel. Other plants went down different routes, with the HTZ plant in Kharkov manufacturing HTZ-16 tanks on modified SkHTZ-NATI chassis (the civilian version of the STZ-3). The Odessa Ship works manufactured the ‘NI’ Odessa Tank on the STZ-5 chassis too. Other experiments were conducted in Stalingrad on another tractor tank based on the STZ-3, however these were never fully completed. 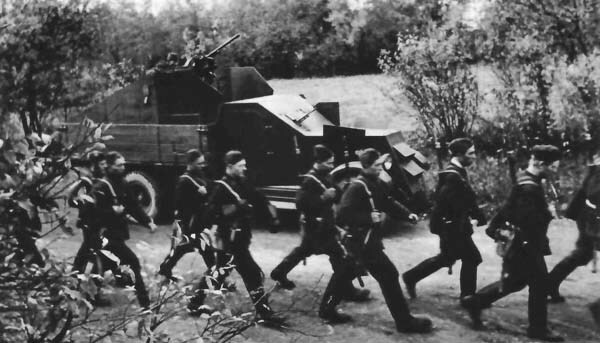 On July 8th 1941, Decree of the Military Council of the Northern Front 53ss was passed. This decree was for the Izshorsky plant to manufacture 20 ZIS-5 trucks with a 45mm field gun placed on the rear of the truck with a partially armoured cab and engine compartment. 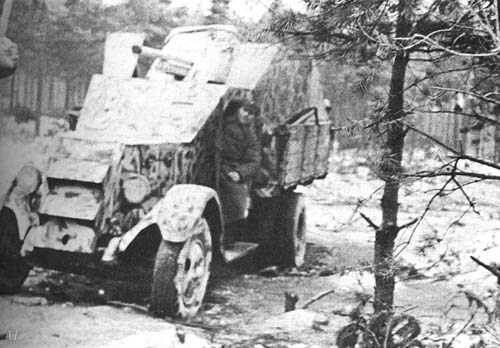 As it was, three different chassis were available for these improvised armored trucks, the GAZ-AA, the ZIS-5 and the ZIS-6. The GAZ-AA and ZIS-5 trucks were equipped with plates that are reported to have been between 3-10 mm thick, that covered the engine and crew compartments. The driver of the truck was situated on the left hand side, with a vision slit cut into the armor. To the right of the driver was a machine gun, which was most likely a DP-28 or DT-29. The engine compartment was completely sealed in, with two small access hatches either side of the engine, along with two armored air intakes over the front grille of the truck. The suspension was unchanged despite the weight increase. The most common variant of the IZ armored truck, with a 45mm gun placed on the stowage compartment of the truck. The rear of the truck was built up with armored sides, however, still had an open rear and roof. The cargo portion of the truck was left unarmored, with this new armored structure placed on top of the folding wooden sides. 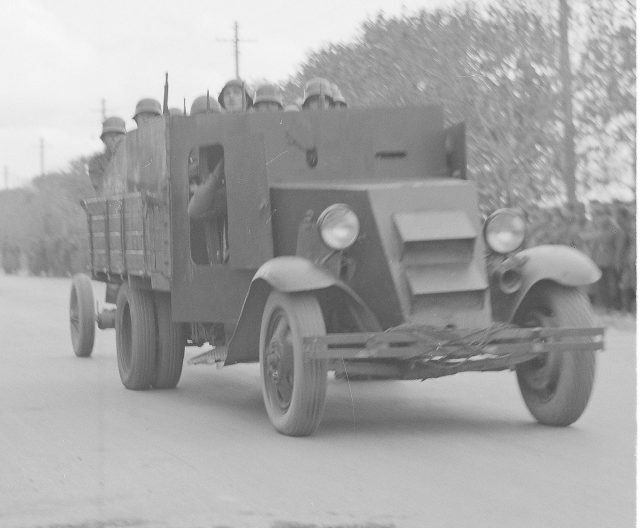 According to the surviving records and photographs, these trucks were armed with either a 45mm gun, a quad maxim gun mount, or nothing at all, functioning more as an armored personnel carrier. The 45mm gun, when placed onto the truck, used the gun shield as part of the armor at the front of the new fighting compartment, with the gun facing forward, and the barrel extending over the engine deck. Wheels were retained on the gun. An IZ captured by Finnish forces. This truck has had the 45mm gun removed. These vehicles were called “IZ”, as the factory that produced them was the Izhorsky factory. It is agreed that, after the initial 20 vehicles with 45mm guns were produced, the plant continued to manufacture armoured trucks in the layouts already described. Roughly 100 of these vehicles were produced from August until December 1941. There was little variation from vehicle to vehicle other than armament. Due to the thin armor of the IZ trucks, performance was not hindered greatly, however the weight of the truck was increased. An IZ that was built and used as an APC. This machine was never equipped with a gun on the rear, however retained the benches on the stowage compartment. 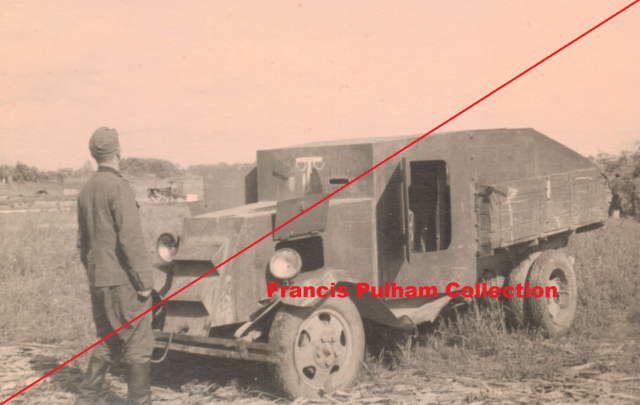 This machine has been captured by the Germans, and a division marking drawn on the cab. 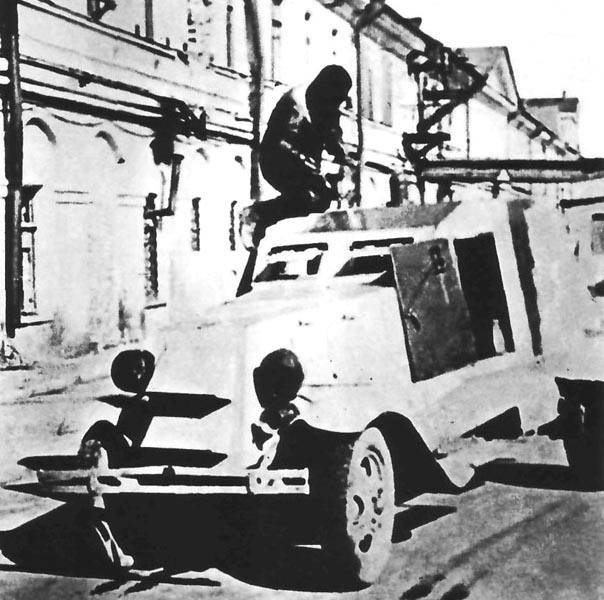 Izhorsky also briefly experimented with the manufacture of an improvised armored car based on the ZIS-6 chassis. The rear of the truck was converted into a fully fledged armored car. This had a box created on the rear of the truck, that on the top had a BA-6 turret. The engine deck was covered in the same pattern armor that the IZ trucks were plated with. It is thought to be a BA-6 turret rather than a T-26 turret due to the weight differences between the BA turrets and the T-26 turret. The thickness of the armor on a BA turret was 9mm thick, whereas a T-26 turret was 13mm thick. 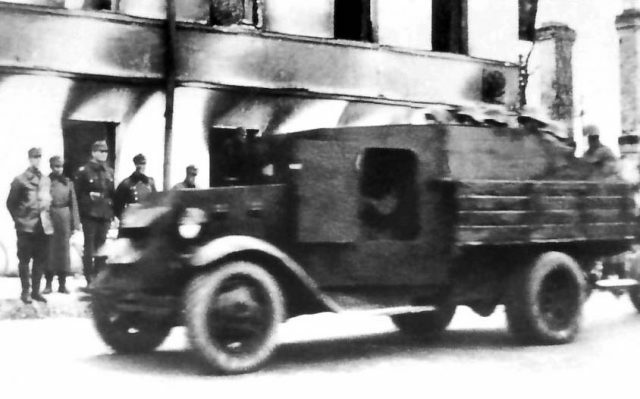 Only one ZIS-6 armored car seems to have been manufactured, and appears in one photograph. 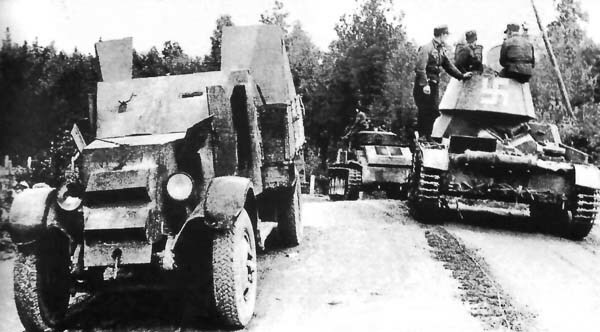 In the foreground a BA-10, and behind this the Izhorsky ZIS-6 truck converted into an armored car. 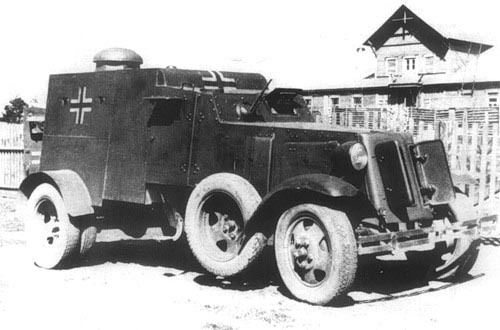 In addition to the creation of a new armored car, Izhorsky also took back armored cars for repair. Some of these vehicles were themselves modified. One such conversion was done to a BA-10. After being returned to the Izhorsky plant, the car was cut down in size. The rear portion of the car, including the rear most drive wheel, was removed. In its place a simple armored cab was placed with a command cupola from what appears to be a BA-27. This vehicle was now an ambulance. It was captured intact, and actually pressed into German service as an ambulance. The first of these “IZ” were delivered to the defenders of Leningrad on the 15th of July 1941. It is unknown when the last example was manufactured. Estimates range from as low as 25 produced to upward of 100. These trucks were reported to have been used on the western front until early 1943. They were only issued to the Leningrad People’s Militia. Several of these vehicles fell into German hands. However, only one is known to have served in the Wehrmacht. A still greater operator of these trucks was Finland. As these vehicles were manufactured in Leningrad, they were only available here during the siege. Large attempts were made by the Red Army to push back the Finnish forces to the north, to allow for some much needed breathing space around Leningrad. Early actions from September to November allowed a small number of IZ’s to fall into Finnish hands, who pressed them into service. It is undeniable that these vehicles were a product of desperation. These vehicles likely performed poorly, as expectantly the trucks with 45mm guns would have been very top heavy. It is far to say that the APC version of these trucks would have been moderately more successful, however their true combat effectiveness is a mystery. An APC version of an IZ being operated by the Finnish army. Notice that the door for the gunner and driver is open. Another IZ in Finnish service. Likely the same vehicle as above. An IZ that has been abandoned. This vehicle is likely based off the ZIS-5 chassis, as the armored cab is different to that of other IZ’s. What is thought to be a ZIS-6 APC IZ. This photograph of the vehicle is the only known example. IZ also experimented with a BA-10 that was cut down and converted into an ambulance. as this picture illustrates, the car was captured by the Germans and pressed into service.